Still a long way to go, but at least the wall is put back together and the stove is working again. And hey look, a backsplash. That was free, salvaged from a trash heap at S's office and sanded for a brushed matte finish. Progress. It looks great. 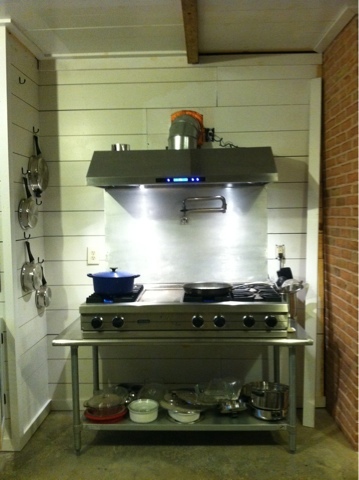 I love the salvaged backsplash. That's cool. I like pans hanging near by. Our's are in a cabinet, but I still like it. Used that pot filler yet? We have had a time trying to find the Log Home Magazine in any store, but they have also published it on line. Here it is.